On May 10, 1940, Adolf Hitler, having ended Poland’s exis­tence in Sep­tem­ber 1939, turned his wrath on the demo­cra­cies in the West. The Nether­lands and Bel­gium capit­u­lated to his war ma­chine in May. Repre­sen­ta­tives of Marshal Philippe Pétain, who had recently been named premier of the French Third Republic, signed a cease­fire with Hitler on June 22, 1940. Hitler could not have made the armis­tice cere­mony any more humili­ating for the French, occurring as it did in the same rail­way car at Com­piègne in North­ern France where Kaiser Wil­helm II’s dele­gates had signed the World War I armistice. Early in October 1940 Marshal Pétain’s collab­o­ra­tionist Vichy govern­ment—named after the resort com­mu­ni­ty in which his admin­is­tra­tion had settled—approved the first French anti-Semi­tic law, Statut des Juifs. Simi­lar anti-Semitic laws were quickly approved in the Vichy North African pos­ses­sions of Algeria, Morocco, and Tunisia. Passed largely unopposed and with­out coer­cion from Ger­man authori­ties, the French defined Jewish­ness in more encom­passing terms than did the Nazis’ in­famous Nurem­berg Laws of the 1930s, and like the Nurem­berg Laws the Statut des Juifs deprived French Jews of the right to hold public office and deprived them of nor­mal French citizen­ship. Naturalized French citizens had their papers revoked. Arrests of Jews in Paris began in May 1941, not long after the estab­lish­ment of a Gen­eral Com­mis­sariat for Jewish Ques­tions. In the sum­mer of 1941 the chasse aux Juifs, the hunt for Jews, began in earnest, so zeal­ously pursued by French collab­o­ra­tors and anti-Semites that even the Nazis were said to be im­pressed. The Milice (French Gestapo, nomi­nally headed by Vichy Prime Minis­ter and Minis­ter of the Inte­rior, Pierre Laval) and the French Self-Defense Corps, both largely manned by native Fas­cist thugs and released jail­birds, helped the Ger­mans round up thou­sands of Jews for depor­ta­tion. 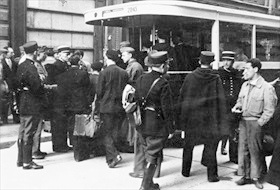 The vic­tims were taken to the newly opened in­tern­ment camp of Drancy on the out­skirts of Paris, others to a camp at Com­piègne. In all, there were over 200 intern­ment camps in France and its overseas possessions. On this date in 1942 more than a thou­sand French Jews, the first of over 75,000, were herded into cattle cars destined for Nazi camps in the East—chiefly Auschwitz—where they would be systematically exterminated. Left: Shortly after the German occupation of France in June 1940, the reac­tion­ary, collab­o­ra­tionist Vichy admin­is­tra­tion of Marshal Philippe Pétain, en­couraged by occu­pa­tion author­i­ties, began a pro­gram of regis­tering all 330,000 Jews in France; only half were French nationals. This photo shows offi­cials examining the iden­tity cards of Parisians stopped at a sidewalk table. Right: The Drancy internment camp northeast of Paris was an inter­ro­ga­tion, deten­tion, and assem­bly camp, mainly for Jews, but also for com­mu­nists, Free­masons, human smug­glers (passeurs), and other “enemies” of the Vichy govern­ment. 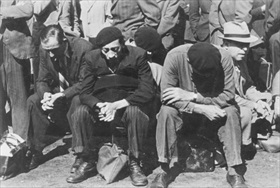 In May 1941, when the arrest of Jews in Paris began, French police brought the first 13,000 of their vic­tims to the Velo­drome d’Hiver, or Win­ter Velo­drome, a Paris cycling sta­dium, a stone’s throw from the Eiffel tower, before busing them to Drancy. 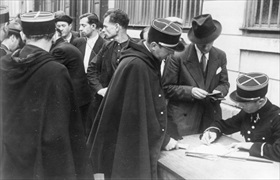 Left: French police arrest Jews in Paris and place them on a bus for trans­port to one of Vichy’s in­tern­ment camps for regis­tra­tion and inter­ro­ga­tion. 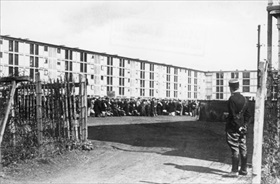 The largest camp, Drancy, together with its five sub­camps, first fell under French police administration. In 1943 the camps became the respon­si­bility of the Gestapo Office of Jewish Affairs in France. 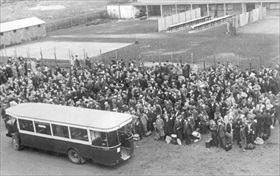 Right: Busloads of Jews arrive at Drancy internment camp in this August 1941 photograph. Left: French police process their Jewish hos­tages. 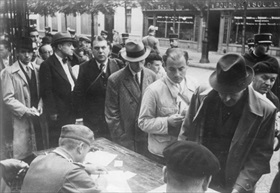 The Ger­man Army set up in­tern­ment camps to hold Allied civil­ians cap­tured in areas it occu­pied in France. Civil­ians in­cluded U.S. citi­zens caught in Europe by sur­prise when Hitler declared war on Amer­ica in December 1941, as well as British Com­mon­wealth citi­zens caught in areas en­gulfed by the Blitzkrieg in the West. Right: Traumatized Jews await an un­known fate. (Could any of them have pre­dicted what Hitler had in store for them?) Between June 22, 1942, and the end of July 1944, 67,400 French, Polish, and Ger­man Jews were de­ported from France in 64 rail trans­ports, mainly to Au­schwitz but some to Sobi­bór, both exter­mi­na­tion camps in Nazi-occu­pied Poland. Among them were 11,000 children, some less than two years old, including infants only days old. People over 60 numbered 9,000. The oldest was a 95‑year-old woman. At the Drancy intern­ment camp just 1,542 inter­nees remained alive when Allied forces liberated it on August 17, 1944.